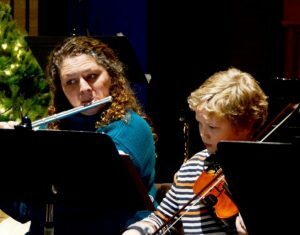 Instrumentalists of all ages and abilities offer their musical gifts during many worship services throughout the year. In addition to participating in the Festival Orchestra, soloists and small instrumental groups can provide reflective or meditative music for prelude, offertory, communion, or postlude. This is an especially fine ministry for youth musicians to offer polished contest or recital music. More advanced players may also have the opportunity to play along with the morning’s hymnody and/or liturgical music as appropriate for their instrument. Any interested musicians should contact Rebecca to arrange music, and to schedule a rehearsal with an accompanist if needed.